In a food processor or blender, add the cilantro, garlic, pepita seeds, salt, pepper, olive oil, vinegar, juice from the lime, mayonnaise, and water. Blend until smooth. 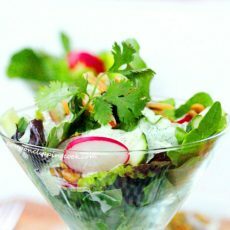 Chill for at least 45 minutes and serve on a salad, as a veggie dip, or on a burger or sandwich. (If serving as a veggie dip or on a burger or sandwich, decrease the amount of water to 1 tablespoon). If serving as a veggie dip or on a burger or sandwich, decrease the amount of water to 1 tablespoon.